The Montgomery County Engineer’s Office is reconstructing the deteriorating bridge on Woodman Drive over the Little Beaver Creek, between Wilmington Pike and East Stroop Road. The contractor is anticipating closing Woodman Drive from Wilmington Pike to Stroop Road the week of September 4, 2018. A Detour will be in place during the duration of the construction. Construction is expected to be complete in November, 2018. The reconstruction of this bridge will require a complete impassable closure of the section of Woodman Drive between Wilmington Pike and East Stroop Road. Woodman Drive will be closed to through traffic in both directions between Wilmington Pike and East Stroop Road. Once the bridge is replaced, Woodman Drive will return to two lanes of traffic in each direction. City and county officials are asking motorists to be alert for the start of construction and necessary traffic control measures late this summer. 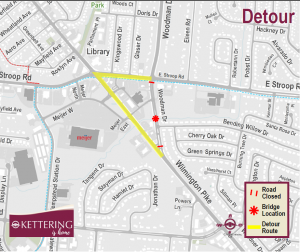 The established detour will use Wilmington Pike and East Stroop Road. Drivers who frequently use this section of Woodman Drive are being asked to plan alternate routes. The Kettering Police Department is aware of this project and will be monitoring the adjacent neighborhood for traffic impact. The City of Kettering and the Montgomery County Engineer appreciate your patience as this project is completed. If you have any questions or concerns about the project, feel free to contact the Montgomery County Engineer’s Department at 937-225-4904 or the City of Kettering Engineering Department at 937-296-2436. Please watch our website, monthly Starter e-newsletter and social media accounts for the most up to date information on the project timeline and traffic impacts.